Every elementary school teacher gives students tests. Here are a few tips that might help with Attention Deficit Hyperactivity Disorder “ADHD” students. Just a few changes can help your ADHD students a lot! Stress accuracy instead of quantity of test questions. This is really what you want as a teacher anyway. Consider modifying the test environment for your student to accurately assess his ability/achievement on subject area and standardized tests. Individual administration in a distraction limited area with frequent breaks will give a more accurate assessment/evaluation than group administration. Use large type. Use easy to read fonts. Divide the page into sections and use a system to cover sections not currently being used. 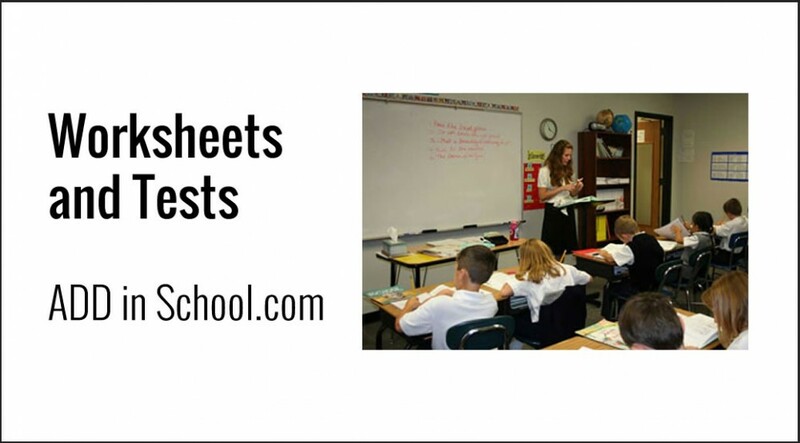 If possible, use different colors on worksheets or tests for emphasis, particularly on those involving rote, potentially boring work. Have the students use colored pens or pencils. Give frequent short quizzes and avoid long tests. Provide practice tests. Provide alternative environments with fewer distractions for test taking. Shorten assignments. If the child can demonstrate adequate concept mastery in 10 or 20 questions/problems, don’t require 30 40 problems.